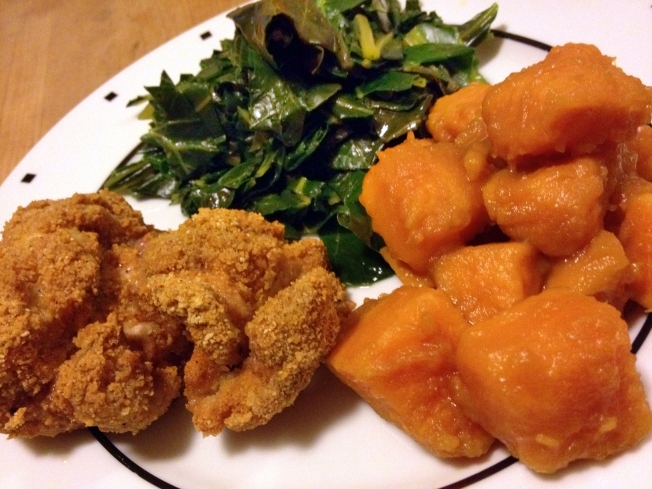 Wayne shares his moms collard greens, sweet potatoes, sweet potatoes and more. My mom is an amazing cook. Some may call her dishes soul food. I just call it the great meals I enjoyed growing up in Houston. This week I decide to share a full meal that would be typical at the Johnson household and mom gave up a few recipes to help me out. I modified the chicken dish, since I don't really do a lot of frying in my kitchen, but the spices are still the same. The collard greens, sweet potatoes, and peach cobbler, though, are direct from mom's table. I hope you enjoy them. Preheat oven to 350 degrees F. Line a large baking tray or pan with aluminum foil and spray with a cookign spray. Set aside. Trim any excess fat from chicken thighs. Rinse the chicken and then pat it dry. In a medium sized bowl, mix together egg, buttermilk, hot sauce, worchestershire sauce and pepper. Place coating mix either in a large bowl or in a large plastic bag. Place chicken pieces, two at a time, in the egg mixture. Drain slightly and then either dregde them in the coating mixture in a bowl or shake them in the large bag of mixture to coat. Place the coated chicken in the baking pan. Repeat with remaining pieces. Discard any leftover coating mixture. Place the chicken in the oven and bake for 50-55 minutes until internal tempearature of the chicken is 165 degrees F and the coating is crispy and golden brown. Serve warm. Bring 3-4 quarts of water to a boil in a large stock pot. Add salt pork and reduce heat to a medium boil for 20 minutes. Meanwhile, trim the stems from the collard greens and then roughly chop. After salt pork has cooked for 20 minutes, add baking soda, stir, and then add sugar and vinegar. Add collard greens. Reduce heat to a simmer, cover the pot, and simmer for 1 hour. Drain, season with salt and pepper, to taste. Serve hot. Bring a large pot of water to a boil. Stir in salt and add potatoes. Boil for 5 minutes. Drain and set aside. In a large sauce pan, over medium heat, melt butter and brown sugar until smooth. Add water and stir until mixture starts to bubble. Add potatoes and reduce heat to a simmer and stir for 10 minutes. Add pecans and stir until heated through, about 2 additional minutes. Remove from heat and stir in maple syrup. Serve warm. Prepare crusts. Combine flour, margarine and cream cheese and mix together with your hands, breaking margarine and cream cheese down into smaller bits. Continue blending until the flour has been incorporated and dough holds together. Divide the dough into two equal parts. Roll each into a ball and flatten slightly. Wrap each in plastic and refrigerate for an hour. Preheat oven to 325 degrees. Prepare one crust for bottom of an 8-by-8-inch baking dish. Roll out crust and cover bottom and sides of dish. Sprinkle a bit of granulated sugar, nutmeg and cinnamon on top. Using your index finger on one hand and your thumb and index finger on the other, form a ridge around the top of the pan. Bake crust in the oven until lightly brown (about 10 to 15 minutes). Remove and allow to cool. Drain the juice from one of the cans of peaches and set aside. In a large saucepan, mix peaches (and juice from remaining can), granulated sugar, brown sugar, and cornstarch. Bring to a boil. Reduce heat to medium. Add 4 tablespoons of butter, 1 teaspoon of nutmeg, 1/2 teaspoon of cinnamon, and vanilla. Continue to simmer until mixture thickens. Remove from heat and allow to cool slightly. Pour mixture into prepared crust. Roll out second crust into a 9-inch square. Cut into strips. Starting on one corner of your cobbler, lay one strip vertically across and lay a second one perpendicular to the first. Continue laying strips in an alternating pattern interlacing them with the previous strips to form a latticework top. Tuck the edges up against the ridges of the bottom crust. Sprinkle the top with granulated sugar, cinnamon, and nutmeg. Dot the top with 2 tablespoons of butter cut into small pieces. Place on the center rack of your oven and bake until the crust is golden brown, about 15-20 minutes.